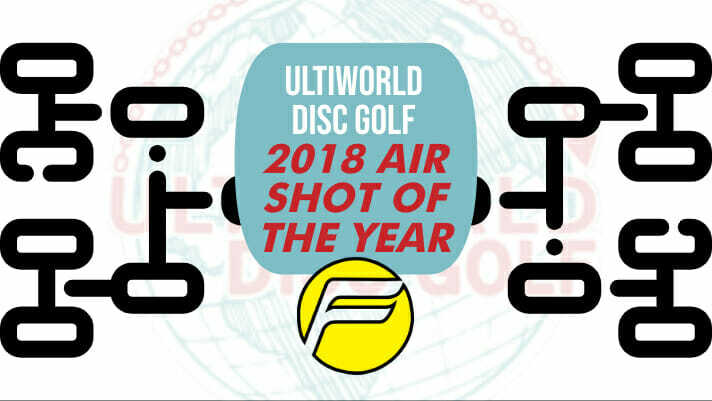 Ultiworld Disc Golf’s 2018 Air Shot of the Year voting is presented by Friction Gloves; all opinions are those of the author. Check out our review of Friction’s DG Gloves here. Pick your favorite entry for Air Shot of the Year from each matchup below, then come back next week for the next round. And if you’re having fun with this, feel free to share the love on social media. This Eagle McMahon throw from the Glass Blown Open may be the most memorable shot of the year. The heat this forehand comes in on to smash chains and stay in the basket from almost 400 feet away on a skip is just silly. Silly. Another impressive throw-in, this one from Georgia’s Ezra Robinson and the tough drop zone around Ledgestone’s water tower. We expected Garrett Gurthie to do fun stuff on his former home course, and we know the dude can throw a mile, but we didn’t expect him to almost ring this up for 2. Similarly, James Conrad has no business drawing metal on 999/1111 at the USDGC. This is just James’ bracket, huh? Maybe his best shot of the year came down the stretch of the MVP Open after he had just dropped strokes off his lead. He lined up on hole 15 and laced this beauty, basically shoring up his win. MVP may have been under more pressure, but the power and finesse to get within drop-in range at the San Francisco Open here by James is just downright impressive. Simon Lizotte found trouble early on hole 1 at the Disc Golf Pro Tour Championship, then casually just flicked this sucker in. This is one of the reasons why Paige Pierce won the USWDGC. Eagle made sure he was going to win the Beaver State Fling when he went for the island green on hole 12. Expert level. He even hit the pole for good measure. Better, but more frustrating, than hitting the pole in crunch time is chaining out for an ace. Drew Gibson was battling for the lead at GBO, and followed up a masterful shot by Simon to almost throw the leaderboard into total chaos. We’re suckers for straight lines through the woods, so here’s Kevin Jones at the Hall of Fame Classic, and Eagle at Maple Hill. Who doesn’t love watching the full flex flight of a disc? Paige got a handful of this one at the Las Vegas Challenge and just parks it 450 feet away. This is the second shot from Seppo Paju that set him up for the first ever eagle on hole 17 in the long position at Iron Hill. We could have also chosen the drive. Paul McBeth’s shot here may not have the same “wow” factor as some others, but he parks this touchy approach on hole 18 at Winthrop during the final round of USDGC while basically playing with the walking flu for two days to secure his second US title. This hole bit so many players at Pro Worlds, watching the lefty Austin Turner just play it to perfection was just a delight. Comments on "2018 Air Shot Of The Year Bracket"